The Colours of Infinity by Arthur C. Clarke is a visually stimulating, intellectually striking, and concise documentary on the mathematical discovery of the Mandelbrot Set (M-Set) in fractal geometry. Arthur C. Clarke was a British author, inventor, and futurist most well-known for writing 2001: A Space Odyssey and Rendezvous With Rama. Aside from being a prominent science fiction author, Clarke’s ideas also contributed to the world of modern science. The geostationary orbit modern communication satellites use is often referred to as the Clarke Orbit after his 1945 essay Extra-Terrestrial Relays – Can Rocket Stations Give Worldwide Radio Coverage? published in Wireless World. This documentary includes interviews with prominent fractal scientists such as mathematics professor Ian Stewart, mathematician Michael Barnsley, renowned physicist Stephen Hawking, and Benoît B. Mandelbrot himself. 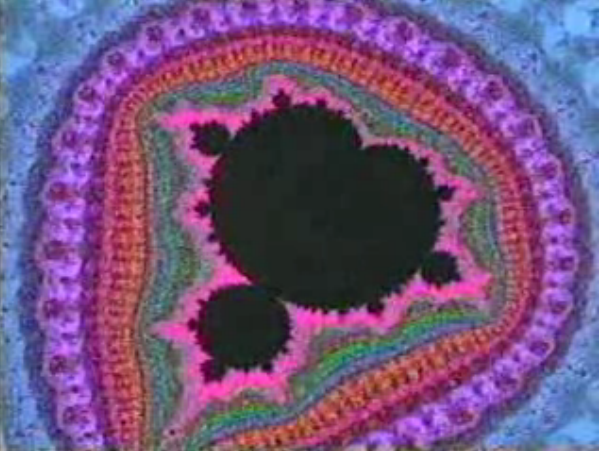 The intricate look into this new science is combined with a number of trippy sequences, backed by Pink-Floyd-esque guitar, that show how changing color representations in the Mandelbrot Set can create stunningly hypnotic visuals. These visuals in particular have been linked to religious art throughout the ages as well as psychedelic visualizations. If you’re curious about learning more about fractals, this is a good place to start.